What do I do if my mortgage company won't properly respond to my RESPA letters? 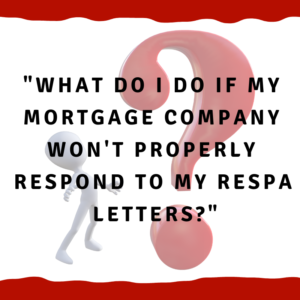 What do I do if my mortgage company won’t properly respond to my RESPA letters? Unfortunately, this is a question that we’re asked frequently by Alabama consumers. Consumers wonder what they should do next, which is a reasonable question. We have a few options when we’re dealing with mortgage companies. Our first option is that it may be time to sue them. This is not always the best option but it can be an option. Maybe we don’t need to give them any more chances. Now, the mortgage company will complain and say that we should’ve given them a second chance to give us the documents, answer our questions, etc. The second option is if they only half answered our questions. If they do this, we can send them a Request for Information letter for the rest of our question. Afterward, we may send them a Notice of Error letter about the same issue, and tell them they made a mistake by not fully answering our question. We should always assume that most of the time when we receive a letter back from the mortgage company we’re going to need to send another letter to them. Most consumers think they’re done once they’ve sent RESPA letters to the mortgage company. Unfortunately, it’s more involved than just sending a letter or two. There’s a lot of back and forth communication with these mortgage companies. Remember that each time these guys don’t answer our questions, that can be a violation of the law. Each time we correspond with them, and they don’t fully answer our questions, that becomes evidence to build our lawsuit against them. We might send out 10 or 15 letters, and they ignore them. That may become 10-15 violations of the law. That could be up to $2,000 per violation. Sometimes we face situations that keep us from being able to do all the back and forth corresponding with them but when you can it is a good idea to do this. Usually, when we send them letters, we get back garbage responses. If they send back helpful responses, that’s wonderful! If they don’t, however, we need to take action. The more they fail to answer our questions, the more serious the lawsuit becomes for them. If you have any questions and you live in Alabama, feel free to contact us. You can reach us but phone at 1-205-879-2447, or you can fill out a contact form and we will get in touch with you quickly. We’ll be glad to help in any way we can, and we look forward to hearing from you.